Fire Emblem Fates smartly revises a quarter-century old battle system and offers ever more reasons to care about your little chess pieces, but neither version does enough to welcome new players. There are two sides to every conflict, and it's rare that you get to experience both of them. Now, through a strange chimera of Pokemon-style counterpart versions and paid DLC, Fire Emblem Fates offers you the opportunity to fight, love, and try not to perma-die in each of two warring kingdoms. Whichever path you choose, it's a long journey, so you'd better know what you're enlisting for. 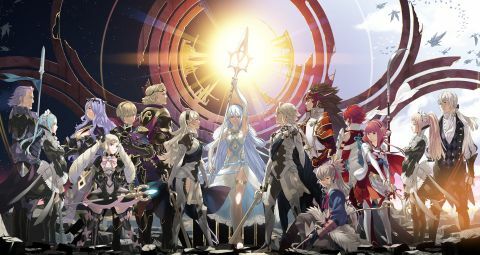 Fire Emblem Fates: Birthright begins as a familiar story of a young, idealistic warband fighting an evil empire. There will be death and tears, but you'll always feel like the hero. Missions have simple objectives like defeating all the enemies on the map or taking out their leader, and you can play extra ones for more experience. In Fire Emblem Fates: Conquest, you probably won't feel like a hero. Choosing to side with the dark empire of Nohr - your grim childhood home - against Hoshido means taking on more varied battles and desperate conditions. You may need to beat a specific number of opponents, or defend a point for a certain number of turns against a superior force, or otherwise alter your usual plan to claim victory. Whichever version you choose, you'll have a war to fight, and Fates makes several welcome changes to Fire Emblem's quarter-century of turn-based, grid-navigating battles. Weapon durability is finally gone, so you won't feel paradoxically obligated to keep your best gear stowed in the convoy for fear of wearing it out. More weapon types are now part of the rock-paper-scissors vulnerability system, meaning you'll be better rewarded for thinking about who to leave standing where and holding what once the enemy's turn begins. That's particularly true with the revised support system. Like in Fire Emblem: Awakening, one unit can help out another by ducking into their protection, or simply by standing next to them. Unlike Awakening, characters being protected will only ever block attacks that target their protector, and characters standing next to each other will only ever help make attacks. Rather than pairing up characters by default and hoping they perform both tasks based on percentage chances, you now know precisely what will happen in a skirmish (assuming nobody misses or gets a critical hit) based on where the belligerents are placed. It's yet another wrinkle to keep in mind when positioning your characters, but swapping out dice rolls in favor of simple, constant rules makes you feel much more in control. Once I got the hang of the new system, my spirit-summoning soothsayer and bow-wielding prince duo became unstoppable, making pincushions of wyvern cavalry and tearing down armored knights like paper dolls. Aside from sharing a brief introduction (which you can skip on subsequent playthroughs) and the same cast of characters (which appear in totally different contexts), both Birthright and Conquest are unique, full adventures - expect to spend at least 30 hours in each. You can download the other campaign as paid DLC, and you can grab a third one, Revelation, starting on March 10. Or just get all three of them in one cartridge with the Special Edition. After fighting alongside one another for so long, they naturally fell in love. Their relationship budded from Rank C to Rank S in a series of cutscenes, and then their child even joined my forces. Fire Emblem: Awakening also let you recruit teenaged offspring, but that was a story about time travelers trying to avert the apocalypse, Terminator-style. Fates' narrative excuse for gathering an adolescent army feels contrived, and I wish it would spend that time fleshing out its pre-existing secondary characters instead. As it stands, several of your soldiers just can't build up rapport with each other for no apparent reason. Maybe they smell funny? Speaking of getting to know one another, the world of Hoshido and Nohr never feels quite as welcoming as I'd hoped. There is a war on, but scrolling through a dry menu full of missions is spartan compared to exploring the big, branching map of Fire Emblem: Awakening. Instead, you'll spend most of your time between fights building a fort in your own little pocket dimension. Opening up this ‘Deeprealm’ as a customizable, interdimensional headquarters feels almost as contrived, though at least it provides a bunch of new ways to play with your toy soldiers (and something to show off via StreetPass and WiFi). Take a soak with your childhood friend in the bath house. Go to the armory and buy discounted swords from the samurai behind the counter. Give your long-suffering butler ingredients to make stat-boosting meals in the mess hall, and listen to how everyone enjoys his cooking. All these interactions cycle based on the real-world time of day, meaning you'll usually have something new to see when you pop open your 3DS - even if you don't have time for a battle. All these little slices of life combine to make one of the sweetest interactive friendship pies outside of the Persona series. It's just a shame that you'll need to be at least a minorly accomplished tactician to taste it. Fortunately, sliding little dudes around on a grid and watching them beat the hell out of each other is still a great time. Whether or not you're not interested in playing through both sides of the war, either version of Fire Emblem Fates will give you intricate new battles to try, interesting characters to befriend, and a satisfying story to witness. And they're even more compelling when taken together. What would it be like if you had chosen differently, if tragic foes stood by your side and cherished friends laid at your feet? You don't need to wonder. You just need to pay up. Description Divided into three parts to tell the same story from completely different perspectives, Fire Emblem Fates challenges you to make an impossible choice between the ones you love.